Bears are not true hibernators, but rather, enter a period of dormancy where they do not eat, drink or expel waste. They do this to avoid burning energy at a time when food is not available. True hibernators reduce their body temperature to match the air temperature around them, but bears’ body temperatures remain close to normal levels. Forest harvesting in central BC occurs in the winter, primarily to protect soils from compacting under the heavy machinery. However, harvesting at this time of year can also cause stress to bears when they are most vulnerable. In their study, Hodder and Rea sought to understand where bear dens are found in the region and how forest managers can minimize impact on these special habitat features. 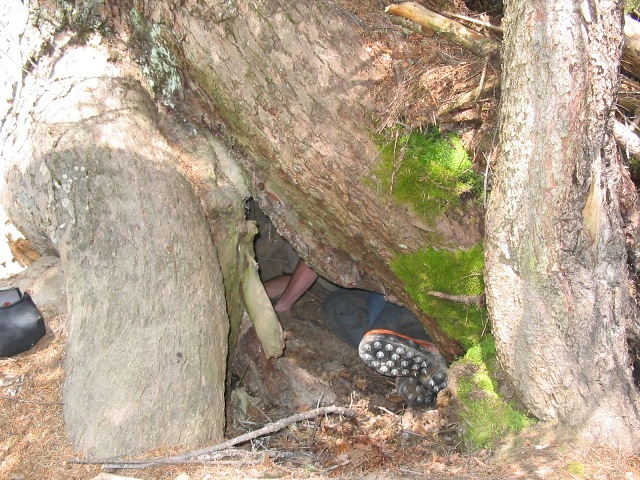 An excavated bear den located under a Douglas fir at ALRF. The three den types are found in different parts of the landscape. Rock dens are basically caves, or cavities within rocky rubble, found at mountain tops and within rocky outcrops. Excavated dens are dug into hill sides and in creek gullies. Tree dens are found along lower slopes and valley bottoms inside very large Douglas-fir trees and along river floodplains within very large cottonwood trees. At Aleza Lake Research Forest, twelve large cottonwood trees were assessed along the Bowron River. Five trees had visible cavities, as much as 5m (20 ft) above the ground and many had claw marks on the bark, both indicating that bears have used them as dens. Cottonwoods grow large in the Bowron floodplain, as much as a meter in diameter or more. Natural pathogens rot out the centre of the trunk without killing the tree. During wind storms, large branches can break off causing an opening into the hollow tree allowing the bear to crawl in and settle down for the winter. Hodder and Rea recommend placing reserves around ecological features that have a high likelihood of rock and tree dens as these are the highest quality dens for bears because they last longer than excavated dens. For excavated dens, creek gullies and areas with large concentrations of known dens should be reserved from harvesting. Because of these habitat features, the Aleza Lake Research Forest tree dens and the surrounding area are reserved from timber harvesting. This way, the dens can be used year after year by bears and other denning animals. Hodder, D. and Rea, R. 2005. Bear dean site selection and considerations for forest management in the interior of British Columbia. Unpublished report.